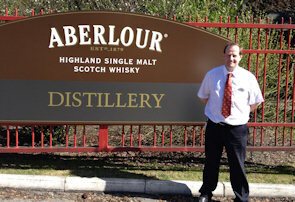 Read about Planet Whiskies tour of the famous Aberlour Distillery in the Speyside Region of Scotland. 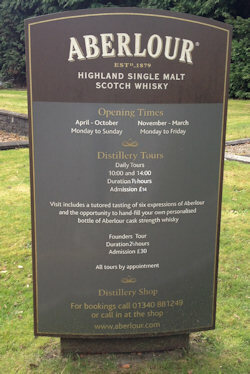 Our tour happened in April 2014 and if you are in the Speyside area it is a must visit for all whisky enthusiast. (booking advisable). 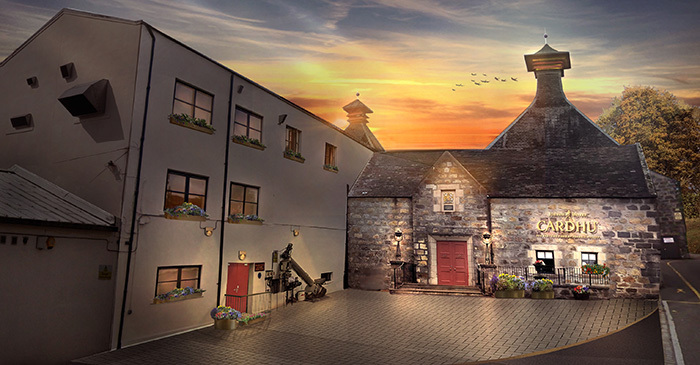 The Planet Whiskies team have been to a number of Scottish distilleries, but on this Sunday morning in the middle of April we had an extra special reason to be excited as we were about to visit the famous Aberlour Distillery in the Speyside whisky region of Scotland. As we drove into Aberlour and then through the gates of the Aberlour Distillery all the pictures of the distillery that had been sent to the Planet Whiskies over the years came flooding back. It was the 10am Sunday whisky tasting tour we were booked on and as always it's good to arrive early at the distillery so you can look around and set the scene for the tour and take any notes about your first thoughts of the distillery. On the other side of the Aberlour Distillery gates and on your right was the lovely building of the Aberlour whisky and gift shop. Just ahead of that was the visitor car park and then the warehouses producing the famous Aberlour malt. We parked in the car park and walked up to the shop to discover a treasure of Aberlour malts and gifts that would be perfect in any whisky collection. As soon as we walked in I saw lovely whisky tasting glasses and knew then that I was going to add these glasses to my collection as well as treat myself to one of the Aberlour malts on display. As we introduced ourselves from Planet Whiskies we were kindly welcomed by Jonathan Osbaldiston who gave us a very warm Speysider welcome. Jonathan started to explain some of the history of Aberlour and that it was a pleasure having Planet Whiskies at the distillery. 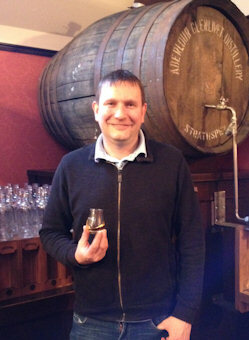 You could tell he was proud to work here and gave us a very good insight into Aberlour Distillery. He then went on to explain that as it was a Sunday morning and the tour was fully booked there was a chance it would start a few minutes late to make sure everyone that was coming had a fair chance to be on the full tour. The shop was beginning to become busy now so we decided that as the tour was 10 minutes away it was a good chance to take some photos of the outside of the shop and the area around the distillery. As we left the shop by the main door and walked to the road again we looked around at the lovely setting the Aberlour Distillery was in. The surrounding area was the fantastic highland scenery of Ben Rinnes that surrounded the distillery in every direction. There was a village stream running down the left hand side of the distillery grounds and this ran the full length of the distillery. You could feel the history of the place just by glancing down past the warehouse towards where we guessed the whisky stills were located. A few minutes later we could see a number of whisky enthusiasts gathering outside the shop and we guessed the tour was about to start. Our tour guide had also arrived and she introduced herself as Emma Reid and gave us a very a brief introduction and explained that there were a few guests still missing. There was a large party of males from the North of England also due on the tasting tour. We waited a couple of more minutes more and talked more about Aberlour then Jonathan and Emma decided that the tour should start and when the missing people turned up they would have to join the tour. The tour started by us walking down the hill and past the warehouses. We entered one of the distillery buildings where Emma gave us more details and information about how the Aberlour Distillery was founded in 1879 by James Fleming at this current location. There was distilling going on in Aberlour 60 years before this time and the first license was issued in 1826 to the Grants and Walkers and carried on till 1840 where it all went very quiet until James Fleming founded the Aberlour Distillery nearly 40 years later. 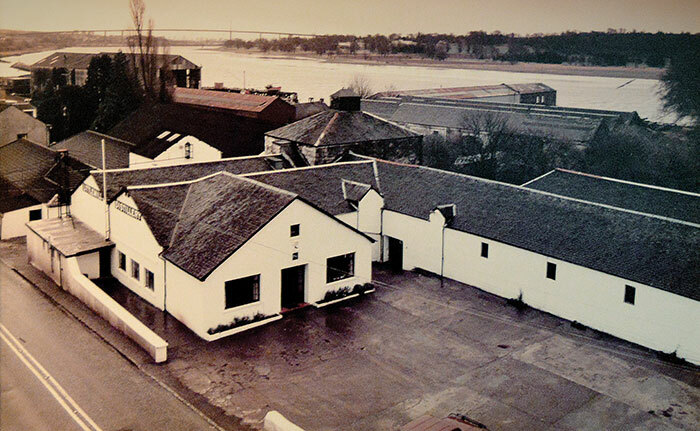 The current owners of Aberlour Distillery are Pernod Ricard who bought the distillery in 1975. Emma then started to explain that the tour we were on was for the whisky connoisseur and would give us a behind-the-scenes access to how the whisky was made at Aberlour and then we would have a tutored nosing and tasting of six of the finest Aberlour malts. 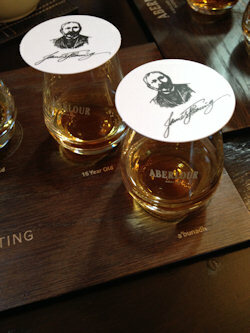 There was also a chance to have your very own personalised bottle of cask strength Aberlour whisky. Emma then went on to say the tour and tasting would last about 1.5 hours. Next Emma started to talk about how the malt barley is processed through the distillery and how the water that is used in the process comes from local springs called Lour Burn. As she was talking the missing guys turned up who were late for the start of the tour. Lucky our whisky tour guide had really just started and decided to start again talking about the barley and the water supply. She then handed out samples of the barley that we could all taste from the different stages the barley would go through. With the introduction and the barley tasting over Emma now wanted to show us all the process in the making of the famous Aberlour malts. We carried on through the distillery until we were next to the washbacks. Emma explained all the processes up to this point and how the barley was soaked for two days to start the germination process and then is dried. This activates the enzymes and coverts the starch into soluble sugars. The malted barley is milled into grist and the process continues when hot water is mixed with the grist in the mash tun. The process is repeated three times with the water becoming hotter each time. This process makes sure nothing is lost and all the sugars are dissolved. Once this has been completed Emma went on to explain we are left with a sugary liquid called wort. Then the washback and fermentation process take place leaving a liquid called wash with an alcohol volume of around 8%. To everyone’s surprise Emma took out a tasting tool and went over to the washback to bring out a sample. She then went around the whole touring party and gave everyone who wanted to try the "wash" a taste. Hard to explain what it tasted like, but it was like a foamy beer in my mind anyway. The next process of the production of Aberlour malts is producing the whisky and this is when the famous Aberlour stills, followed maturation in a range of oak casks, come into use. Heat is added to the wash as it travels through the stills and alcohol starts to evaporate. After this the liquid is put through a condenser and the alcohol rises to about 25% volume. It then travels through the spirit still which finally turns the alcohol volume to 69-72%. This was all explained extremely carefully by our tour guide and gave a really good insight to how the Aberlour Distillery functions and creates their Speyside malts. 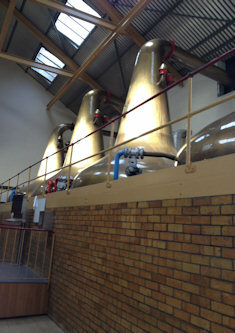 The tour of the distillery was now coming to an end as we walked past the stills and through a door to the outside world. The tour was excellent and you could hear everyone discussing what they had seen over the last 45 minutes. But now it was tasting time and you could tell everyone was looking forward to this even though it was still early on a Sunday morning. 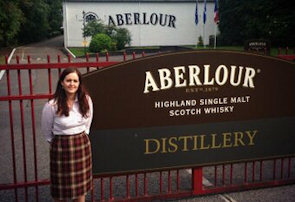 Emma then took us to a different building within the array of buildings that make up the complex at Aberlour. The tasting room was something special with around 20 tables with four chairs to each table set up with a selection of Aberlour malts. The tasting was going to be of five malts from Aberlour and also the New Spirit that was produced straight after the distilling process was finished. The New Spirit was the first to try and as you would have expected was very strong in taste. Now it was time for the five malts and there was a buzz around the room as Emma introduced each one of them. 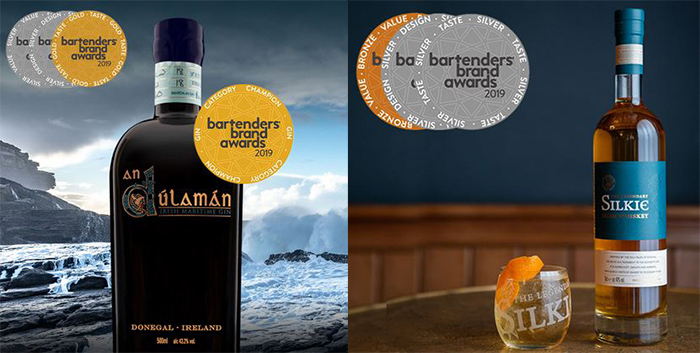 The first two malts were a Bourbon Cask Matured and a Sherry Cask Matured. It was very interesting tasting them both next to each other as you could really tell the difference in taste between them. You could also tell instantly the one you preferred, but as you would expect everyone in the room had a different opinion and that's the great thing about whisky consumers as there is no right or wrong answer. It is just what you prefer. The next three malts we were going to try we all knew very well. The first one was the Aberlour 12 Year Old Double Cask which is a deep red-amber colour. 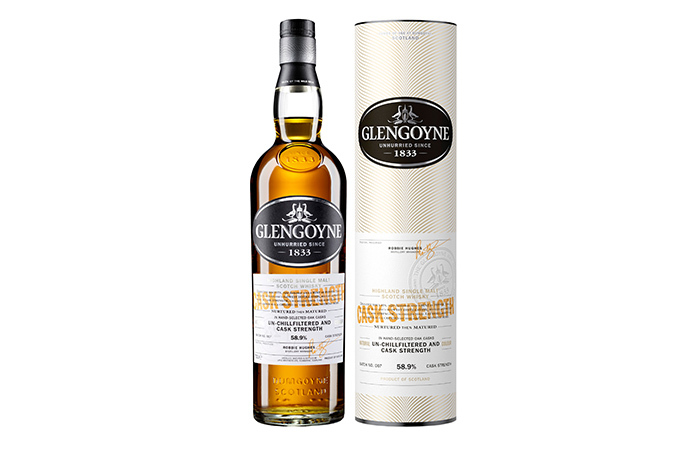 When first tasting this malt you could taste the honey and sweet sherry oaky taste. On the nose it was slightly smoky, but you could also smell red apples. On the palate you could taste chocolate, toffee, cinnamon and ginger spiciness and the finish was warming with a hint of ginger, but becoming dry as the malt went down. 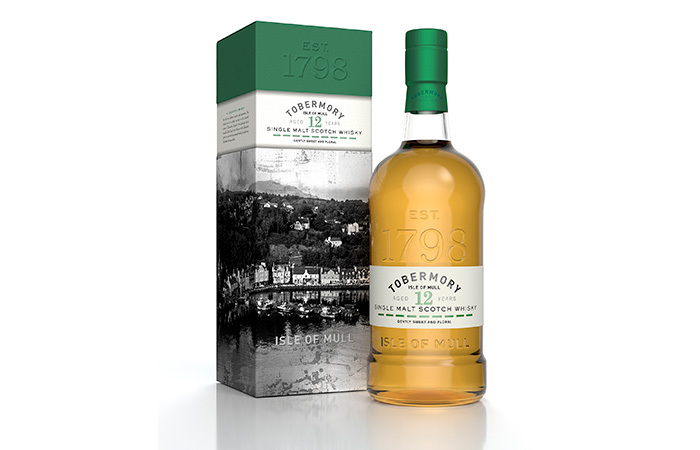 Just one word could be used to describe the Aberlour 12 Year Old and that would have to be "exceptional". The next malt on the menu was the Aberlour 16 Year Old Double Cask. This was a malt that was on my mind to buy when in the shop earlier as I had tried it before and loved it. The colour of the 16 Year Old was a warm, golden amber. To the nose it smelt very creamy and you could feel the sweet raisin aromas and spices fill your nose. To the palate it was very smooth with all the floral and spicy flavours coming together with a gentle oakiness taste coming through. The finish was soft and smooth, but lasted a long time with the honeyed spiciness staying with you for a good few seconds. It was as good as I remembered from a few months back and it was definitely on my shopping list now. 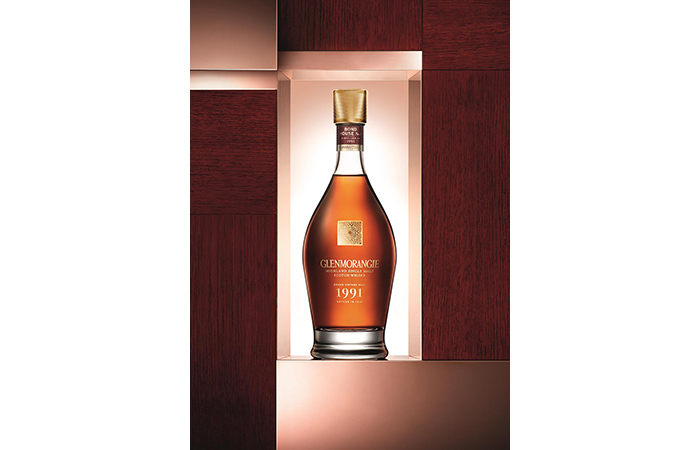 The final malt was the A'bunadh which is a unique cask strength perfect for everyone and loved by whisky connoisseurs. The name of this whisky means "the original" in Gaelic and is made using traditional methods which means no chill filtration or anything new in the process of whisky making. A'bunadh is a deep rich amber colour and when putting the malt up to your nose you can smell the aromas of spice, praline and spiced orange which all go hand in hand with the notes of Oloroso Sherry. To the palate you can taste a number of lovely flavours including orange, black cherries, dried fruit and ginger and it is extremely full bodied and creamy. The finish is special and long lasting. You can taste all the spices, dark chocolate and oak taste lasting for a good few seconds before the joy of the A'bunadh disappears deep inside. It was a very fine selection of malts to have in the tasting, but like all whisky tasting experiences the tasting had to come to an end. There was now a good few questions going around the room about each of the malts we had tried in the tasting and Emma did very well answering all the questions. She then went on to say about having your very own cask strength bottle and she pointed to the casks just behind her. 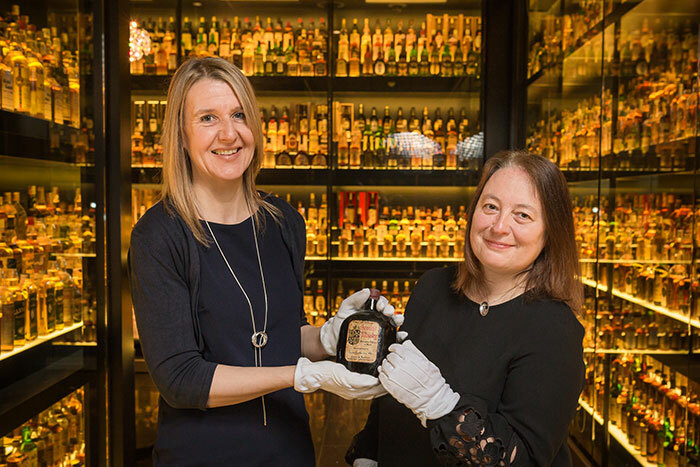 There was a lot of talk about this when our tour guide mentioned this earlier and now when people had the chance of having their own personal bottle of Aberlour cask strength there was no shortage of people in our tour lining up to pour their own bottle and buy it. 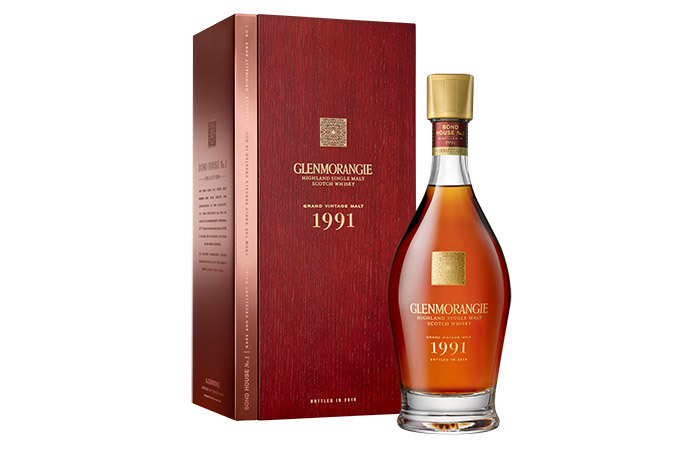 I decided earlier that I was going to buy the Aberlour 16 Year Old and so decided not to go for this option. As we walked back up to the whisky shop we all took in the surroundings again. It was lovely to be in this part of the world again and thoughts were already in my mind about when I would be back up in Speyside. We had reached the shop now and it was time to buy my tasting glasses and whisky. Jonathan was there to welcome us back from the tour and take any orders we required. He asked everyone how they enjoyed the tasting and of course the tour and there was not a single person who had a bad word to say. 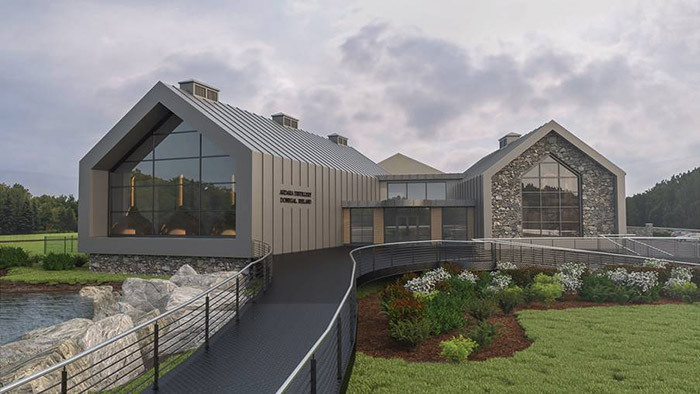 That is all down to the excellent set up at the distillery and the time and money that has gone into making it a very enjoyable experience for everyone. 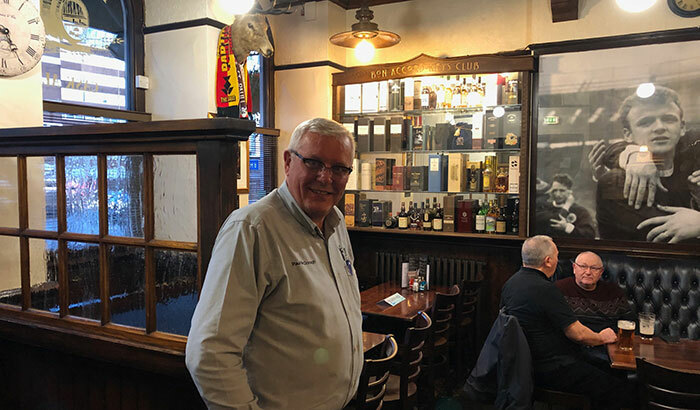 After buying my purchases and saying my goodbyes to Jonathan and Emma it was time to have a walk about the village of Aberlour and go for Sunday brunch while thinking about my time at the Aberlour Distillery. 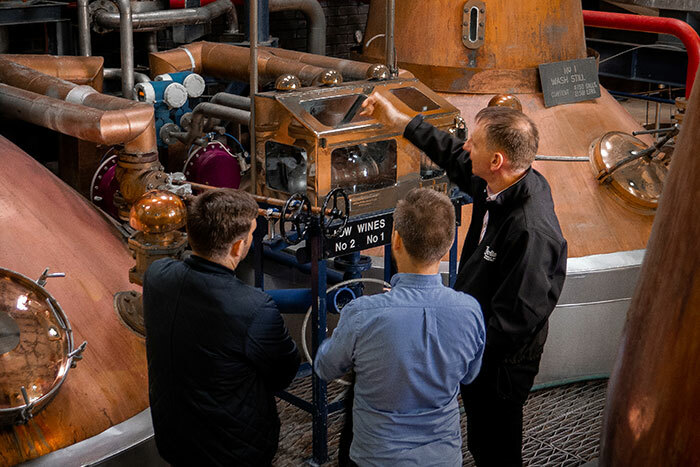 A special treat for the connoisseur, with privileged behind-the-scenes access to how our whisky is made and a tutored sampling of the best of the best. The tour lasts 1.5 hours for up to 16 guests, beginning at 10:00 and 14:00. In peak periods, tours may also be available at 12:00. Please check for availability. 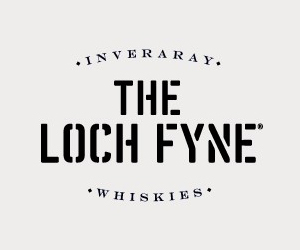 For serious whisky aficionados, this is a unique opportunity to sample some very special drams indeed – some vintages that aren’t commercially available at any price. 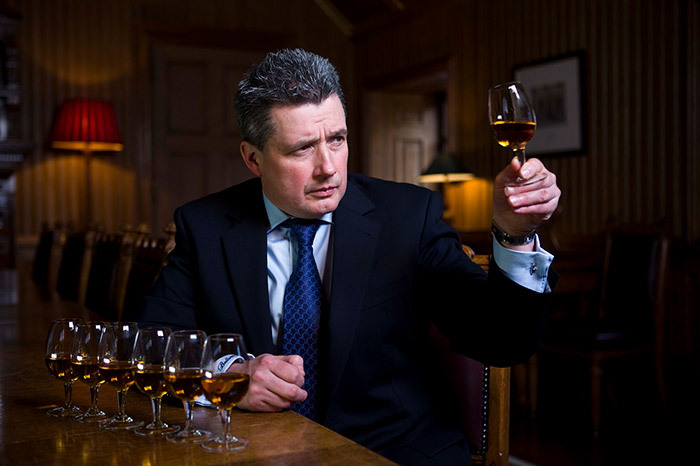 The tutored tasting takes place in the luxurious Fleming Rooms, but does not include a distillery tour.